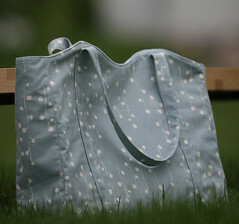 I just finished making the Eco Market Tote (pattern by Favorite Things) for our friend Cyndi. I chose a lovely Japanese linen for the outside and some neutral heavier cotton (maybe a twill?) for the lining and front contrast. 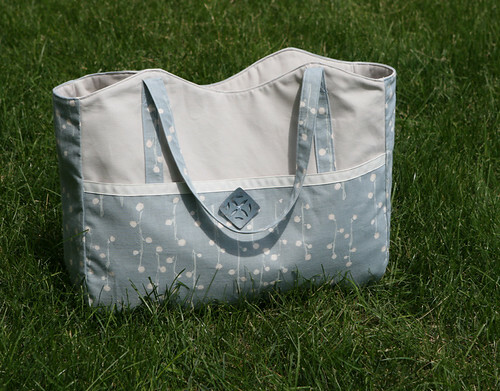 My thoughts on the pattern were that I found the directions to be a little too vague-- They just weren't clear enough to me when referencing the different pieces of the bag. I eventually sorted it all out though. I also found that when stitching in the bag side, I came up short where the top of the side met the top of the front and back bag pieces. I would cut that side piece out a little longer in the future since I can always trim off extra. I don't know if this was a problem with the pattern with the fabric stretching. The directions called for a small double pocket on the back, but I felt it would look so much nicer without that. Instead, I put the pocket on the INSIDE and made it wider and maybe a little taller. It's nice to be able to quickly find your cell phone and other small items w/o it being an eyesore. I added ribbon to the top of the outside pocket on the front of the bag. I thought it gave it a little extra detail. I did not put in a button hole, but instead sewed the button on for decoration as a "dummy". I installed velcro to hold the outside pocket closed instead of using a buttonhole. However, I think I sewed it a little lower than I should have. If I did it again, I would put it about 5/8" down from the top of the pocket. The velcro strip was a little over 2" wide. I sewed the velcro to the pocket lining so the stitching would not show through the front of the pocket. I top stitched around the opening of the bag. I lined the handles with some lighter interfacing and the rest of the bag with fusible fleece to give it structure (I cut the seam allowance out of the interfacing to reduce bulk; it looks so much nicer). I use the fusible fleece in my bags. On the other bags that I've made, where I use a lighter upholstery fabric and quilting cotton, the fleece is the perfect weight. On this bag, which is also much wider, it did seem a little heavy. 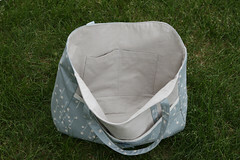 I used a a heavier lining fabric on this bag too, so that is probably part of that bulk. I had never sewn with linen before. I found it to be a little fussy with my machine. It liked to shift on me causing my stitches to be a little crooked here and there. I've found this site, through google...and then through flickr because of some of the images you have uploaded of some Favorite Things patterns you have made. If you aren't already, check out our facebook page and become a fan, we would love for you to upload some photos to our fan page as well. Hi Kim, I'm so glad you like the bag! =) It turned out really nice and the recipient loved it. I'm one of the few people not on facebook or I'd upload a shot for you!